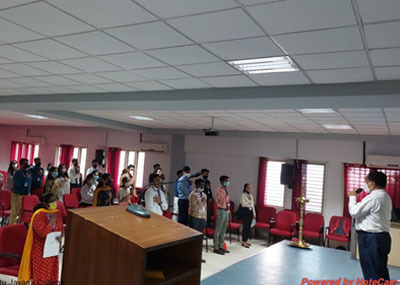 The attitudinal workshop is organized by School of Management for the first year MBA students after they complete the training on Life Skills. The MBA programme of Kristu Jayanti School of Management is designed to cover all the four pillars of higher education, Knowledge, Skills, Attitude and Values of a student. 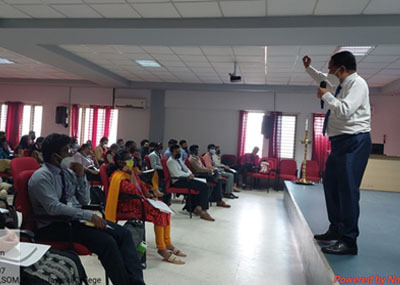 The attitudinal workshop is conducted in collaboration with Prof. Antony Williams, founder of ZEAL institute, Bangalore. Prof. Antony William is a renowned motivational and success speaker who is originally from Kolkata and is currently based in Bangalore. He is the founder and the director of ZEAL institute Bangalore. He has an experience of 28 years and he has been training management students from top level management schools and corporates. The two day workshop is conducted at the premises of School of Management itself. The workshop covers various aspects of a student’s attitude from knowing oneself, goal setting, positive thinking, self-confidence and belief, leading a purposeful & successful life, presenting oneself in the public, inter & intra personal relationships, maintaining a good personality, accepting others and adjusting oneself etc. The workshop is fully packed with group and individual activities that also helps in developing the team building skills, leadership skills and communication skills. Students have benefited phenomenally from this attitudinal workshop and hence Kristu Jayanti School of Management is organizing this workshop for every batch of students who steps into the school. Students also receive a certificate for successful completion of the workshop.